Visit and explore one of the largest primary lowland dipterocarp forests on the island. With its giant trees and massive pillars, It is one of the most prestigious regional areas, part of the 30 protected ecosystems in ASEAN, and since 2011 part f the ASEAN Heritiage Park together with the Sungei Buloh Wetland Reserve. 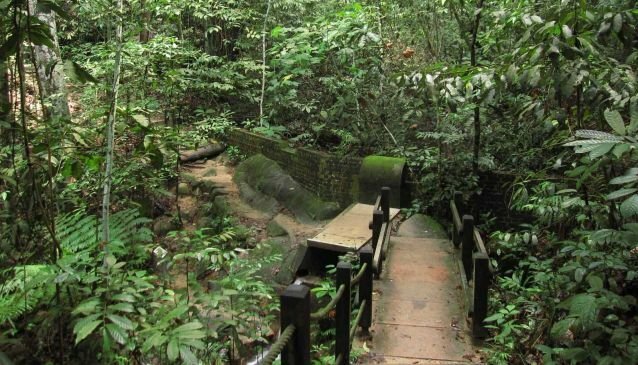 At 163.63m, the tallest hill of Bukit Timah Nature Reserve is also the highest peak of Singapore. The forest contains only 0.2 percent of the island's total 163 hectares, but its rich biodiversity accounts for 40 percent of the nations flora and fauna.
. This particular vegetation originally had been cleared due to logging and cultivation, and now remains quite undisturbed. The four nature reserves, MacRitchie Reservoir, Lower Peirce Reservoir, Upper Peirce Reservoir and the Upper Seletar Reservoir ensure the quality of water. Do stop at the Visitor Centre to learn all about the native flora and fauna of the nature reserves. Then go for a hike or with your bike, choose your route sometime easy sometime steep but most importantly go at your own pace. You'll love this park for its quiet atmosphere adorned with more than 850 flowering plants and some 500 species of animals including the curious long-tailed macaques.